Duet Laser Filament Detector Artemis EZRstruder Mount w/ Round Edges by GeekStreetSolutions is licensed under the Creative Commons - Attribution - Non-Commercial license. This version of the Duet Laser Filament Detector for the SeeMeCNC Artemis 300 has been modified to include a 0.2mm Radius on most edges. Special thanks to BuilderBot3D for the original design and for providing me with the original files. 3x M3x16 Socket Head Cap Screws to connect the body. 2x Screws to attach laser monitor. I had two Philips head screws from my extra printer parts. 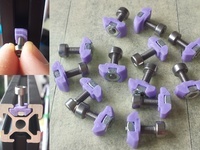 The mounting holes are not threaded so you'll want some screws that will cut into the PLA and hold well. 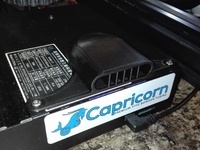 Wiring: I used this product from Amazon: OKGEAR 3 Pin Sleeved Fan Cable extension 48" by Coolerguys. I cut the female connector off one end, and then fished the end with no connector from the top down through the front left extrusion and out the hole where the extruder wires exit out from. I then slipped on a piece of heat shrink tubing over the wire sleeving, crimped on one of the white connectors that came with the laser sensor and shrunk the heat shrink over the end of the sleeving. The connector on the top connects to the Pin E0 on the Duet. All steps are quoted directly from the Duet3D Dozuki Page. Make sure you have calibrated your extruder steps/mm correctly. If you haven't done so already, send the M591 command with the correct D, P and C parameters and S=0 to tell the firmware about the sensor. Run M591 D# where # is the extruder number and check that the sensor angle is reported, to confirm that communication from the filament monitor to the Duet is working. During and after the print, as soon as sufficient filament has been extruded you can use M591 D# (where # is the extruder number) to report the minimum and maximum measured movement as a percentage of commanded movement. If you pause and then resume the print, on resuming the calibration will be re-started and the values accumulated from before you paused will be discarded. Set the R (tolerance) parameter of the M591 command to give a somewhat wider tolerance than the calibration reports. For example, if calibration reports 43% to 115% then you might choose R30:130. 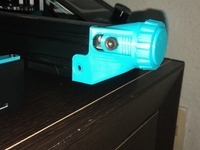 It is worth testing with a wide variety of filaments that you typically use before setting the minimum and maximum trigger values as the laser sensor is sensitive to filament material. 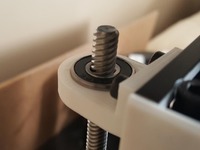 Alternatively you can use a different bracket of minimum and maximum for different filament types by setting the M591 setting within the print start gcode, through a macro or through the filament management system. The following is the resulting code I ended up using after following the Calibration steps. Say thanks by giving GeekStreetSolutions a tip and help them continue to share amazing Things with the Thingiverse community. Say thanks and help GeekStreetSolutions continue to share amazing Things with the Thingiverse community. You'll need a PayPal account to tip GeekStreetSolutions. Click the button below and you will be redirected to PayPal. Once the payment is complete, you'll be brought back to Thingiverse.